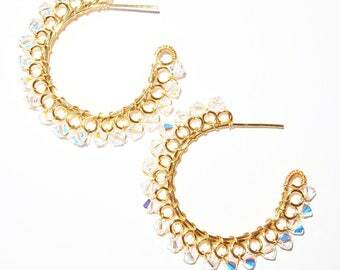 Delicately and carefully wire-wrapped Swarovski crystals into a curvy pair of elegant hoop earrings to frame your face. Shimmer and shine in these earrings that not only look decadent but weigh a mere 2 grams each. With the dimensions of 4cm x 4cm ,they are just the right size on you , to be noticed and labelled the fashionista of the day. I love hoops , and absolutely love Swarovski crystals. I wanted to make hoops of as many colors that I could match with my outfits , and this design was the outcome. 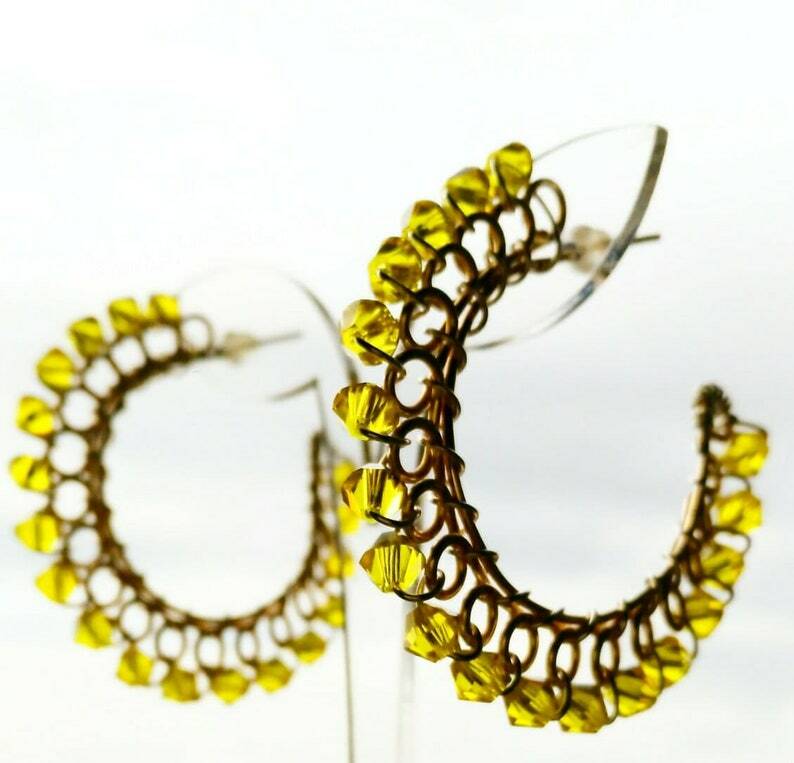 For a custom pair of hoops using any color from the Swarovski Classic Crystal Collection, send me a message and we will work together to make the perfect pair created by you , for you. All my earrings come with silicon earnuts for comfort and ease of use. Gold and Silver Professional Craft Wire is used in the making of these pieces. These are fashion jewelry pieces and the wire is plated , with either gold or silver over copper. Remember not to use any jewelry for that matter when showering, working out (sweating) and do not spray perfume on them too .This will ensure that they remain their best. Wirewrapped jewelry is not so soft,but it can be bent with force, just like any other metal hoop earrings .But do not worry , it is also very easy to reshape. I use authentic Swarovski crystals from an authorized agent so you are indeed getting the real thing! Shop with confidence with my 100% refund policy. More details on this in the Shop Policy section. Depending on whether I need to make the item for you, in the event that it is a custom order, or I have a backlog of orders, the shipping time may vary but will not be longer than 3 weeks. lovely. quick shipping. super seller. will buy again, thanks. This is a perfect gift for my friend who loves amethyst! Quality is excellent and the combination of green stones and purple stones make this a keeper for all occasions! Thank you. Really happy with my purchase. It's so intricately made, love the pink opal!